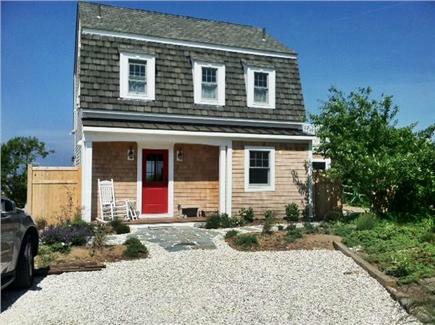 Newly Renovated Historic Cottage w/Private Stairs to Beach! Bay Vu Cottage with 270 Degree Waterviews! Living Room with Panoramic Waterviews! BayVu Cottage, circa 1910, completely renovated in 2014! Renovated Historic Cottage located in the Cape Cod Shoreline, atop a grassy dune looking out across Cape Cod Bay. Private stairs lead you to the warm, calm waters of an extensive private beach where you can swim, kayak, sail, paddle board,windsurf your way around the Bay or just relax and watch the birds, oystermen and changing tides from the deck. The open floor plan has a gourmet kitchen, antiques and private master suite. 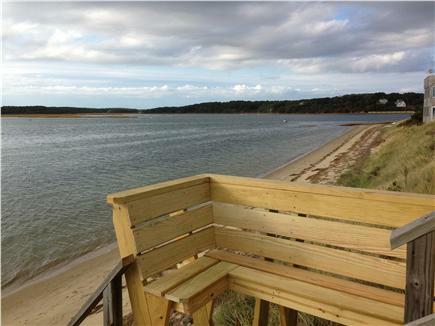 This is the most dramatic location in Wellfleet, on the dune with your own stairs to the sandy,swimmable beach. 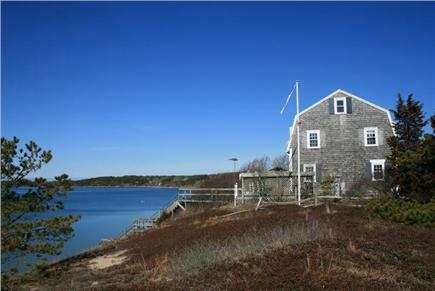 This 3 story cottage has 270 degree views overlooking Cape Cod Bay, Lt.Island,Blackfish Creek and Great Island. The main floor has a new fully equipped kitchen, dining room, living room, half bath and large screened porch. The second floor has 2 bedrooms (2 queens), a den with futon and two full baths. The 3rd floor is a large bunkroom with 4 twins. The Cottage is surrounded on 2 sides by a fully furnished wood deck with fabulous sunset views and a large screened porch. Take a refreshing shower outdoors (enclosed/Hot & Cold) while watching the boats sail by. 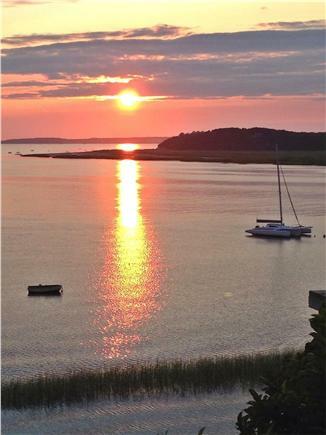 A few minutes away is the historic village of Wellfleet, incredible ocean beaches, fresh water ponds, marinas (boat rentals: sailing and fishing), antiquing, summer theatre, dancing on the pier, Audubon Nature Center for birdwatching and a 24 mile bike trail connecting Cape Cod towns. Just a short drive up the cape is Truro with a winery and ATV Dune tours...continue on to Provincetown for amazing shopping, restaurants and Whale-Watching! This is our second year renting this beautiful home. It had plenty of space for all of us and the view can't be beat. We look forward to many more visits. I stayed here with a bunch of girlfriends for a fall weekend, and it was perfect. Great house, fully re-done but with original charm. The weather was a bit rainy but we still loved the waterfront location. Very private. Tina, thank you for the lovely review...we enjoy renting the house to others who appreciate nature. It's such a special location. Hope you and friends plan to return. My family and I stayed here in August 2014. The location could not be more perfect. It's at the end of a sandy road that opens out to an expansive view of creek and harbor. From inside the house you feel as though you are floating on the Bay ! Beautifully renovated, the house itself lacks nothing. I particularly liked how the owners incorporated the modern conveniences but kept just enough of the original charm . You won't want to leave!